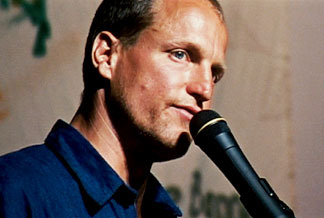 For Go Further, Canadian documentary maker Ron Mann (Grass) trains his camera on actor/activist Woody Harrelson's "SOL" (Simple Organic Living) tour, a road trip down the West Coast of the U.S. with a bio/diesel-fuelled bus and a bunch of friends on bicycles. The tour stops at various college campuses along the way to lecture the students on environmentally sound living practices and occasionally, lead them in yoga postures. It also visits various activists and businesses committed to environmental and social change, including a sustainable paper company, an organic farm, a worm composter, the Ruckus Society's training camp, and '60s legend Ken Kesey, whose Merry Pranksters' road trips were an inspiration for the tour. Ron Mann is a smart filmmaker who knows that a Hollywood actor, however earnest and likeable, who uses his considerable disposable income in support of a pet cause, is hardly a relatable lead subject. So Mann instead wisely chooses to devote the bulk of his film to charming every-dude Steve Clark, a production assistant and junk food addict who was asked to come along after meeting Harrelson on the set of Will & Grace. Woody's environmentalism 101 lessons merely provide the backdrop for Steve's transformation from average American kid (eating a bad diet laden with grease and sugar, smoking cigarettes and pot, etc.) to enlightened organic being. He becomes so enlightened so fast, in fact, that they pick up a love interest along the way for him to serve as the film's second healthy living convert.